If your decorations aren’t already up you’re probably already planning on adding something festive to your yard soon (unless you just aren’t into that sort of thing). Thing is, it doesn’t take much to turn your decor into a disaster. Here are 5 ways to make sure you avoid a display that sends Santa running for cover. 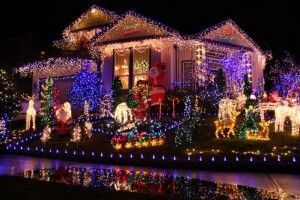 Don’t overdo it with the lights. We’ve all seen that family who puts lights on every available outdoor surface. Like this picture. Right here. The result isn’t festive: it’s gaudy. Besides, it’s a great way to send your electric bill into the stratosphere. Less is more. Choose a few focal points to display your lights, and let them draw the eye. Skip the red and green. Sure, they’re traditional Christmas colors, but they’re also plastered all over every retail store display. It doesn’t take much for most people to get a serious case of red and green fatigue. Blue, gold, or white can provide a nice change of pace. Or go bolder by using one of these creative color palettes. Go easy on the inflatables. And don’t use them at all if you’re going for a classy, classical look. If you’re going to use them, choose one or two that follow a theme. Don’t be extra. Nobody needs to see every last Disney character, Santa dragon, festive Marvel mock-up, Stormtrooper in Santa hats and…well, you get the idea. If you don’t have any, don’t make this year the year you finally get one. There’s nothing worse than wading out in the snow to deal with a deflated inflatable. Make sure your lights are rated for outdoor use. Look for an exterior GFCI outlet to plug them into. Don’t have an exterior GFCI outlet? You might want to call in an electrician to install a couple of them before you get out your ladder. Failing to do anything else is playing with fire. Literally. Failing to use light clips. People try all sorts of things to hang their lights. Most of them make a mess and risk damaging whatever you’re hanging them on. Skip staples, nails, and clothespins. Hardware stores sell 100-packs of holiday light clips for less than $5. You’ll emerge from your outdoor decorating spree a lot less stressed, too. Bonus tip: don’t forget to have fun! Don’t feel like you have to decorate just to keep up with your neighbors. The holidays are supposed to be fun. If wrestling Rudolph into position makes you want to rip your hair out, skip it and have a hot cup of cocoa instead. Life’s too short!